Bombay Brasserie (in both Adyar and Nungambakkam) is here to take you on a journey of flavours from across the country while in the comforts of their restaurants in our very own city. Here's what we loved. Expect the class of a French-style brasserie and the explosion of close-to-home Indian flavours…You'll be pulling out your phone to take pictures of not just the restaurant done up in blues, whites and wooden accents but also of the pretty plates of food. We were childishly obsessed with the Juhu Beach Gola, slurping on the icicle dunked in a glass of kaala khatta. Tangy, sweet and oh-so refreshing! 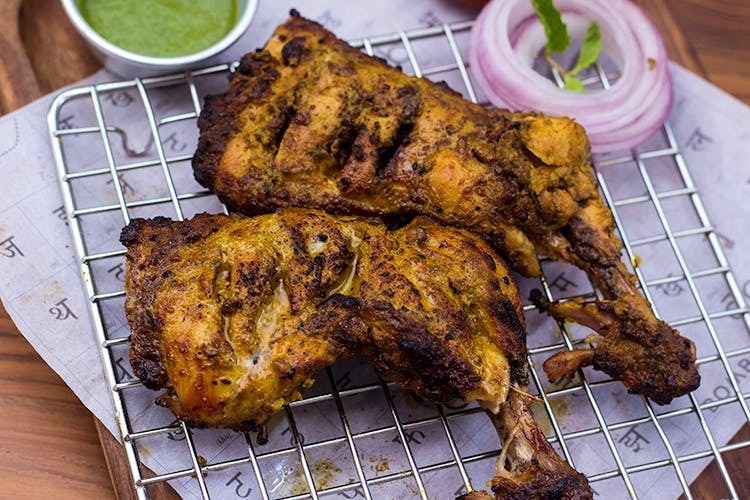 Don't go straight to the main course, instead do try the starters like the Amritsari Machchi Tikka, Panch Phoran Chicken, and Kashmiri Naan Kebab ( that comes with an incredible walnut dip). Vegetarians, check out their cheesy chilli kulchas. We liked that all of the dishes were yum and not nauseatingly filling. For mains, dunk their crispy, flaky Chur Chur Paratha into the spicy Bombay Dabba Gosht ( Bohri style mutton masala) or tuck into a wholesome Bombay Lunch Home Veg Curry With Banana Leaf Rice. End on a sweet note with their creamy Amritsari Kulfi (with falooda and rose syrup)...delish! We didn’t like the combination of roshogulla topped with aamras made from mangoes. We also found the desserts a bit too sweet even for dessert!